For many people Victorian antique Christmas houses bring back fond memories of Christmases past when many families displayed miniature holiday villages underneath their yuletide tree. From its early beginnings in the communities of the Moravian Dutch settlers of Pennsylvania, to the elaborate winter villages popular in the 1950s and 1960s, miniature holiday scenes have captivated the imaginations of young and old alike. Each holiday scene is known as a putz and comes from the German word putzen which means to place or to put. Other popular names for these tiny holiday towns include Christmas Gardens and Train Gardens. Prior to the late1920s putz houses were homemade, crafted from paper, wood or cardboard. In the latter part of the decade, cardboard boxes shaped as tiny Victorian houses and log cabins were placed under the Christmas tree holding holiday candy. The first known Japanese pasteboard houses were imported in 1928. These adorable little buildings were sold in Sears & Roebuck and Montgomery and Ward catalogs and F.W. Woolworth 5 & 10 cent stores. 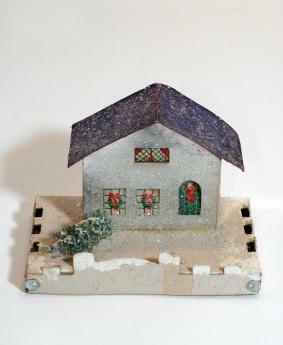 From 1928 to the beginning of World War II Japanese pasteboard Christmas houses were made in several styles and designs. Throughout those years Victorian houses always remained a popular style. The following are the different types of pasteboard houses. Lithograph print 1928 -1930: These houses had sides in plain colors with lithographed masonry work around the windows and doors or lithographed brick. A hand painted snowy roof appears to sparkle from the effect of glitter with glitter. Gloss Tops 1930 -1933: Lacquered roofs painted over to look like snow. The walls are generally solid color. Shellac 1928 - 1932: Houses coated with shellac. From the mid 1930s to the beginning of WW II houses were made in very bright colors and had cardboard sides that resembled stucco. These are sometimes referred to as Haciendas. Another wonderful and magical website with a spectacular collections and display of antique Christmas houses belongs to novelist Antoinette Stockenberg. Ms Stockenberg began her hobby of collecting Japanese made pre World War II putz houses, including many fabulous examples of Victorian miniature houses. Creating her miniature worlds on the mantels in her home, her displays are complete with appropriate accessories for the period, bottle brush tress and antique German lead flats, called zinnfiguren. These are the tiny figures that make up the people and animals of a Christmas village. To view the villages from previous years click here. Antique Victorian Christmas houses are found on many online auction websites and antique stores. From its early days as a dime store Christmas decoration to becoming a highly sought after antique collectible, Victorian antique Christmas houses are tiny treasures from years gone by..